Need a Lift? | Comics I Don't Understand - This site is now being updated daily at http://www.comicsidontunderstand.com. Please change your bookmark if necessary, and notify any web site with a link to the old address. This one is a bit confusing. All of the chairs seem to be going in the same direction, which doesn’t make sense. 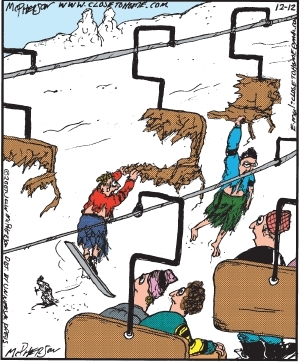 It might be funny if the hanging riders appeared to coming from the top of the lift instead of going toward the top. I think they are coming from the top of the lift. I guess it’s a comment on what happens if you don’t jump off your seat at the right moment. I see it as one of those “you are going to die and there’s nothing you can do about it” moments. The people going up the hill can clearly see that something horrible is happening to the people up there, but they have no way to avoid it. Dosen’t make any funnier but might solve the confusion. src thinks as I do. I foresee a huge monster’s maw at the top, a monster happily sitting there as food comes along the conveyor belt pre-set into bite-sized portions. Around comes a chair… chomp! Next chair… chomp! Same ski lift as this In the Bleachers. Oh it took me a minute to figure out that people were hanging on to the broken remains of the chair. They looked like they were covered in fur, which I didn’t get. Yeah, I definitely think it’s just an “Uh-oh” gag. The humor comes in the thought that they are trapped going to the top of this hill and can see that something bad happens, but they have no idea what. It seems like pretty dark humor, but humor nonetheless. I think most of the funny is in the imagination of what could be at the top. I found this hilarious. There’s obviously something wrong with the roundabout at the top of the chairlift and those going up the mountain are just realizing it. I laughed out loud at both of them, but the “In the Bleachers” one is even funnier.